Oh my goodness, do I have something to share with you today! October 7, 2017 was the most popular wedding date of the year according to the knot.com. Paige & Pete's were the most perfect couple to take full advantage of this coveted Fall wedding date. Everything was planned meticulously in order to have everything perfect, and boy, was it! This wedding was everything you dream of when you think of the word classy. 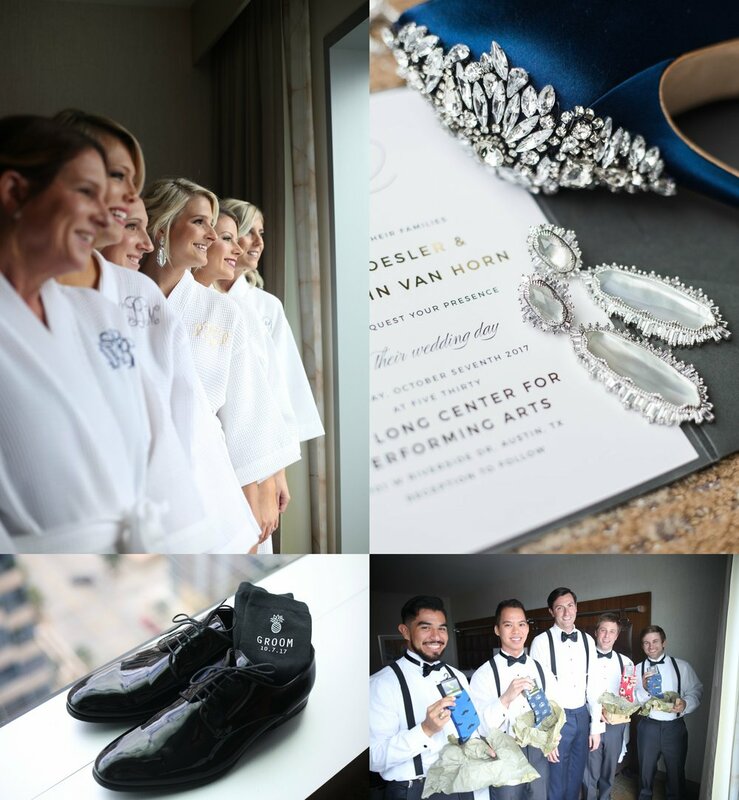 The class started with the groom's hand-made suit to the lust-worthy jewelry and jeweled high heels that the gorgeous bride, Paige had ready to wear for her big day. 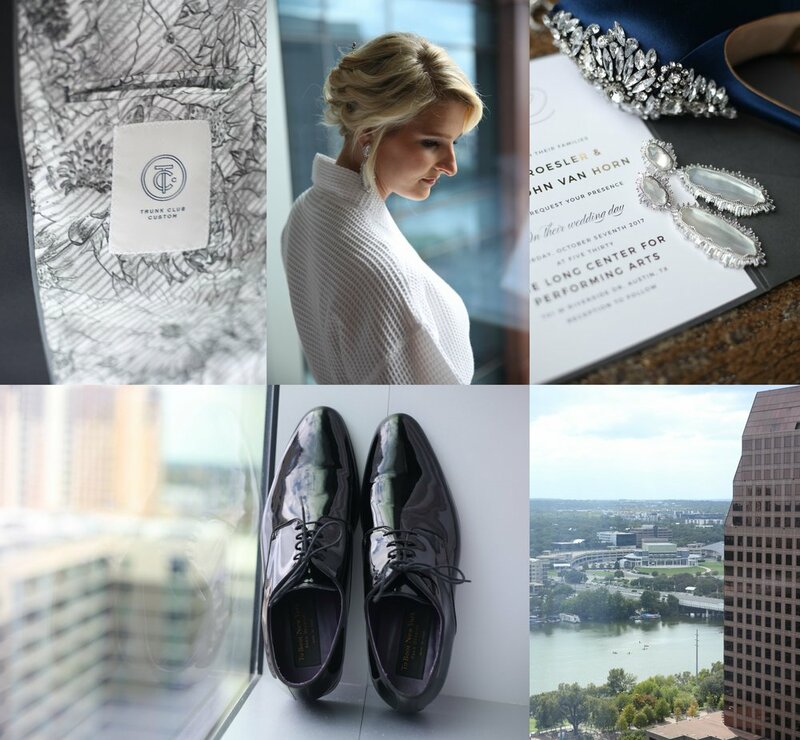 Everything was ravishingly sophisticated and as I walked in to the hotel room where the bride and bridesmaids were getting ready at the JW Marriott, the view from the window just so happen to face the exact direction of their venue across the river at The Long Center of Preforming Arts. As the beautiful bride, Paige was having her makeup completed, she kept an eye on the setup of their ceremony site from across the river. This happenstance created a sense of perfection as if everything was exactly where it should be-and might I mention, the view was phenomenal! He sat eagerly in the chair that had a view of downtown Austin & while he waited, Paige sent a gift over to him. As he opened the box, wondering what his wife-to-be was gifting to him, a huge smile swept across his face as he soon realized it was a book meant just for him. Each bridesmaid & groomsman treated me as though we had known each other forever and were very down to earth. Amazing details, perfect wedding date and Bridal party aside, Paige & Pete were the true reason I was looking forward to being able to capture the love on this wedding day for so long. As I got to know Paige & Pete throughout their long Engagement, I began to really enjoy being around the two. They just have a loving sense about them & my eagerness for the wedding day to arrive had been growing. Finally We loaded up & headed over to The Long Center, where the bride & groom first saw each other for their First Look. But first, Paige & her father had a First Look moment as well. It was hard not to tear up myself, knowing how important these moments are to each of them. 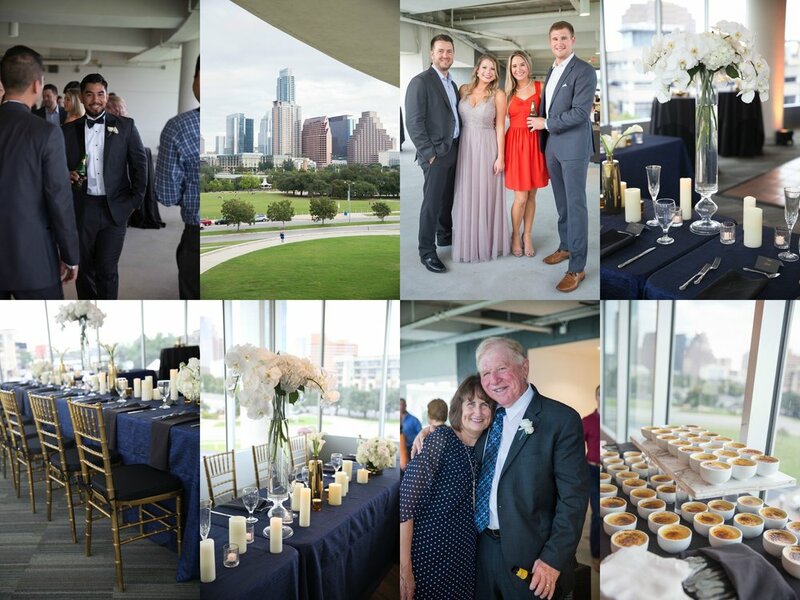 Standing in front of The Long Center, Pete turned around to see his beautiful bride. In that moment, Paige began to tear up with happiness as Pete looked at her in awe. The fun loving relationship between the two was unmistakable as they both grinned ear to ear. It was time. It was the moment they had been preparing for their entire lives & everything was in it's perfect place. They were ready to say the truest words they will ever say. 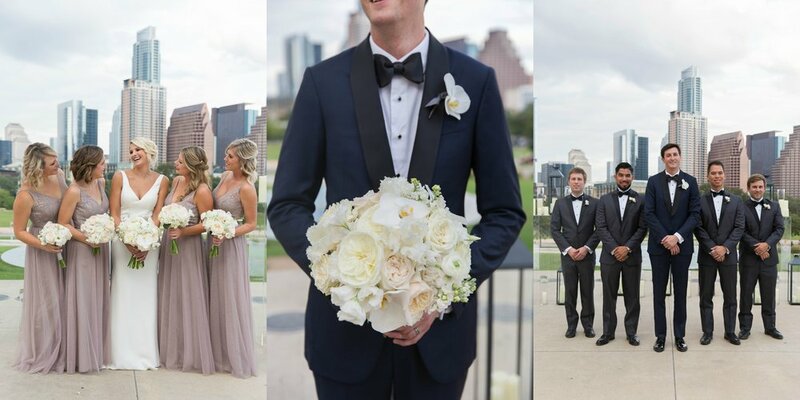 A thin veil of clouds covered the Austin skyline, hovering over the guests and embracing the bride and groom. He stood across from her, tall and dapper, with a secure smile, a quiet confidence, and, of course, in his sharp navy blue handmade tuxedo. A classic look for a classy groom. Her gaze met his, and in her white sleek dress, with bright, hopeful, adoring eyes and trusting hands, a gentle heart, and an eager soul, she began to say her vows. Just like that, they were officially husband and wife and very ready to start the celebrations! After a fantastic evening filled with delicious food, dancing with friends and family, Paige & Pete were sent off in a very Austinite way-by pedicab! Everything was absolutely incredible & most importantly, the pair became one. To Paige and Pete, thank you for trusting me with capturing your big day for y'all. I really do cherish you both and hope that when you look at these memories and moments, now and forever, you’ll always be reminded of why you truly love each other and bring a smile to your face. Cheers to you both- I pray you have a strong marriage and continue to create many more fun memories down the road together! 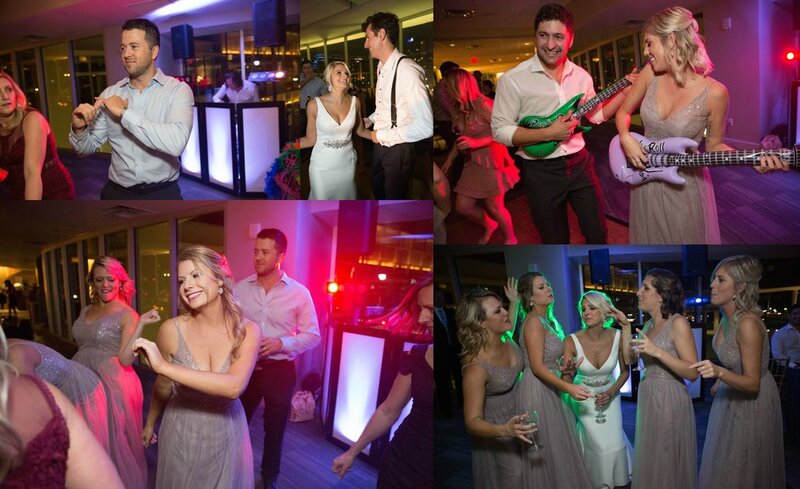 Special thanks to all of the fabulous vendors who made this wedding a reality for Paige & Pete!